Florida Council of Independent Schools. “Accreditation Standards - Checklist for Evaluation.” 2009. Freeman, Geoffrey T. “The Library as Place: Changes in Learning Patterns, Collections, Technology, and Use.” CLIR Reports. Council on Library and Information Resources, 2005. Web. 21 Nov. 2009. Jackson, Louie. “Can You Hear Me Now? School Marketing and the Social Web.” National Association of Independent Schools (NAIS). National Association of Independent Schools (NAIS), Winter 2009. Web. 21 Nov. 2009. I have been a professional librarian for over 25 years, working in medical, law, business and school libraries. 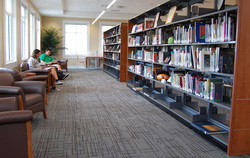 Presently, I am Director of Library Services at Miami Country Day School in Miami, FL. I am a member of Beta Phi Mu. This chapter highlights library advocacy, gives nine educational guidelines and offers methods for fostering 21st century competencies for students in grades K-12. Collaboration and successful teamwork involving Faculty, Administration, Admissions and Institutional Advancement are crucial to the effective leadership or our campus libraries. As Independent School Librarians, our mission has always been to lead…creatively, comprehensively and compassionately.